The Red Sox have recalled right-handed pitchers Steven Wright (pictured) and Brayan Villarreal and infielder Brock Holt from Triple-A Pawtucket, multiple outlets have reported. The three players join the major league roster following Pawtucket's elimination from the International League playoffs on Saturday. 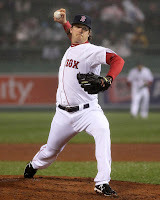 Wright, the knuckleballer acquired in July 2012 in exchange for first baseman Lars Anderson, has made four appearances with the Red Sox this season where he earning a pair of wins in relief. In 24 starts with Pawtucket, Wright was 8-7 with a 3.46 ERA and 99 strikeouts across 135 1/3 innings pitched. While Wright was used exclusively as a starter with the PawSox, he will provide bullpen depth for the Red Sox. Villarreal came to the Red Sox from Detroit in the three-team deal that brought Jake Peavy to Boston from Chicago and sent Jose Iglesias to the Tigers. In his only appearance with the Boston, he walked in the winning run in a 3-2 loss to the San Francisco Giants. In 23 career major league outings, Villarreal is 4-8 with a 4.56 ERA. The 26-year-old appeared in five games with the PawSox, allowing a run on three hits and striking out six in 5 1/3 innings. It will be the third stint at the major league level this season for Holt, who saw significant time at third base in the time between the Iglesias trade and the recall of Will Middlebrooks, starting eight of 10 games in one stretch. Holt had a modest .203/.275/.237 line with 11 runs batted in over 59 at bats during his time with the Red Sox and hit .258/.327/.309 in 85 games with Pawtucet.